I've been lost of late in the world of Thrush Green. Is anyone else familiar with Miss Read's books? Dora Saint, known to her readers as Miss Read, is best known for her Fairacre and Thrush Green novels. She started her professional life as a teacher in 1933, but began writing during the war years. She returned to writing in 1955 with her first stories about a village school in make-believe Fairacre. "The gentle, lyrical ambience of life in a typical English village, complemented by John Goodall's charming illustrations, caught the public imagination, and the book became an instant bestseller." 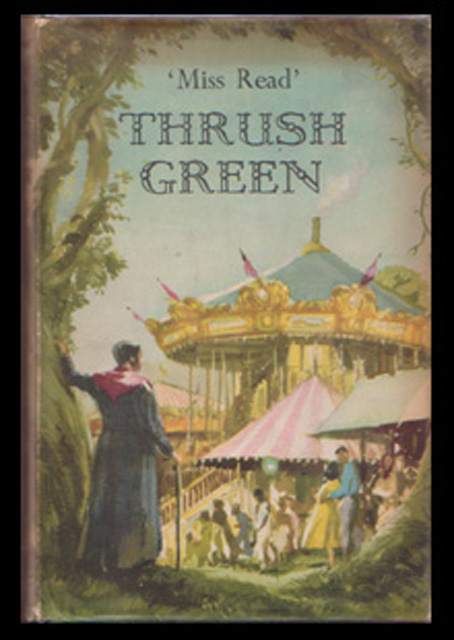 She continued the Fairacre stories while also writing the Thrush Green stories which she began in 1959. This is the series I decided to start with because it is based on the real village of Woodgreen in Oxfordshire where Dora lived during WWII. I had never heard of the Miss Read books until a few years ago when I picked up one at a used book sale because of the lovely cover by John S. Goodall and started actively looking for them at sales. Over the years I've collected three Fairacre books and six Thrush Green books but it was only just this winter that I decided to read them! I chose Thrush Green because I already had six books and could get the rest from my library system. Plus, I loved the idea that the fictional village was based on a real village. It only took the first book, Thrush Green, to hook me on the village and its inhabitants. I know I'm all in when I keep having to remind myself it's only fiction because I've started wishing I could visit the book's setting and have started caring about the book's characters! Earlier this year I wrote about small town life in Letters from Myself reminiscing about my teenage years in Valparaiso, Indiana after immersing myself all autumn in the little town of Lillian Jackson Braun's Pickax City, Michigan. 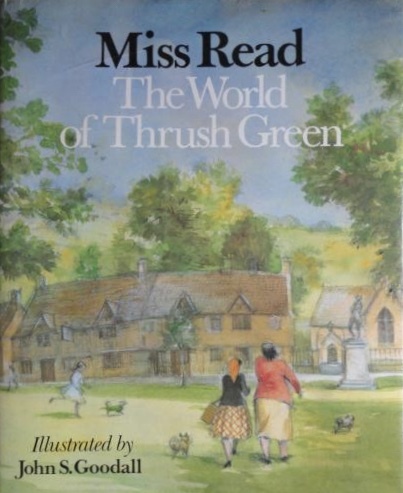 This winter/spring I'm immersed in the little English village of Thrush Green. I find myself dreaming of moving to a similar village, but then am rudely awakened to the fact that no such place exists within 50 miles of my grandchildren except in my imagination---fueled by stories of bygone villages of yesteryear. If you grew up in a village setting I would love to hear your stories of what life was like. And if you live in such a place NOW please do tell us all about it, unless, of course, you wisely want to keep it a secret. And if you know of other series set in a quaint village I'd love to know about them. I'm set for awhile, but will need a new series come next winter! Oh, me too! I am about three quarters way through the Thrush Green books, with plans to move on to Fairacre as soon as I am done! They are so utterly charming and gentle. Another favourite authoress of mine is Maeve Binchy, but while she carries out familiar themes and characters across her work, it is a different way of life again to rural England. Deborah, I feel you and I should meet for a cup of tea and some good gossip about the inhabitants of Thrush Green! You must be further along than me. I'm just finishing up Return to Thrush Green. I've been alternating Miss Marple with Miss Read, so it is taking awhile and now that I can be out in my garden/woods I do not have as much time to read. After spending all day in the yard reading at night puts me to sleep! I will put Maeve Binchy on my list. Thanks so much! Absolutely love all the Miss Read books. Read them all at least twice. I love your pseudonym! Miss Marple is another series I'm reading about village life, only with all the murders that seem to follow her about I'm not so sure I'd care to live in St. Mary Mead! I know what you mean. Have you seen any of the Miss Marple films? Yes, I have. I saw the TV series years ago and then started watching the videos after I started reading each story this winter (I started at the beginning) but then stopped after the second one because they changed it too dramatically from the story. I did love seeing the English village they used, though, for one of the stories. The older ones with Joan Hickson are the best ones. They are lovely and she portrays Jane Marple brilliantly. I haven't seen a Joan Hickson one in years. She is the actress that Agatha Christie wanted to play Miss Marple. I read my first Miss Read for our bookclub at Christmas, and it was a Christmas story. I found her writing charming and I am anxious to read more. This caused me to go back to your post about writing yourself a letter. Have you continued that? I realize that I still have a ever so slight anticipation when going to the mailbox j u s t i n c a s e there might be a letter there. And a few days ago there was! And to further respond to that other post, I grew up in a small suburban town somewhat like the one in Indiana you describe (mine was a bit further north in Illinois.) The "uptown" is still the same today as it was then. My childhood best friend (since birth) is coming to see us the end of this month. We have kept in touch all these many years--mainly through letters! I journal daily about what's going on in my life--but I have been very neglectful about writing myself back! 😀 Before email I was always writing people, but responses were slow in coming except from my mother. Since email I do get a little more response from people--so at least that is a positive about our electronic age. Most glad to meet you ladies. Love your conversations. So nice to meet you Robyn! Thanks for joining in. I met Miss Read many years ago and have probably read them all at least twice. I'm sure you will enjoy both settings. My modern favorites are the Jan Karon novels. I learned to appreciate the many series that were available. I learned to enjoy fictitious settings with characters who grew to be "friends". You met Dora Saint? Please do tell us all about it! I read that Jan Karon was influenced by Miss Read's books so it's no surprise that you would like her, too. I've not read the Mitford series, but I have been to the charming village of Blowing Rock, NC that Mitford is based on. I will have to put her on my TBR list, too. As a child I did not read very much, so I am making up for it now! Be sure to read them in order so you don't get ahead in the story of their lives together in the village. I know what you mean about having a longer reading list. I told my husband just the other day that I won't live long enough to read everything I want to read! I need to add these to my long line of must reads. I think you enjoy them, Martha Ellen, if only for the description of the cottages in the village and the landscape surrounding it.